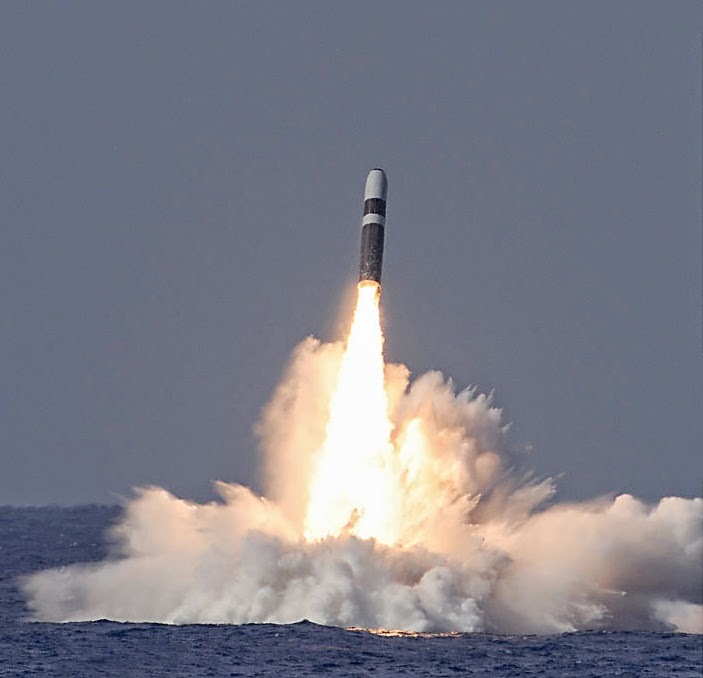 Lockheed Martin proudly announced the 149th and 150th successful test flights of the Trident II D-5 submarine launched ballistic missile, test fired from an unnamed U.S. Navy OHIO Class ballistic missile submarine based in Kings Bay, Georgia. 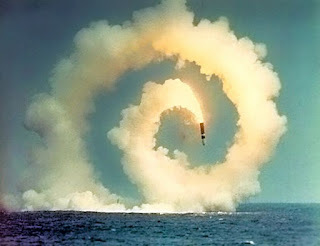 The two Trident II D-5 missiles used in this test cost $70.5 million each (for a total of $141 million), plus all the costs of reconfiguring each missile for the test, and other costs, including securing the launch area and tracking. The Navy carries out these tests after a Trident sub has finished a major overhaul to ensure that the missiles will work flawlessly should the order to launch (armed missiles) be received by the Tridents out on patrol. With up to 8 (100 or 475 kiloton) thermonuclear warheads per missile (current estimate: 4 warheads), the death, devastation and radioactive fallout would be horrific. And, one can only wonder how many missiles would be launched. These are the missiles that will be deployed on the next generation of ballistic missile submarines currently in the research and development phase and due to begin construction in 2019. 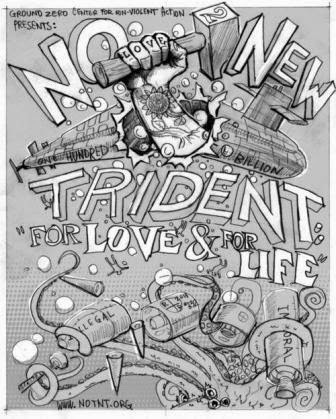 So we say NO To NEW TRIDENT!!! We say YES to real efforts toward disarmament (and dramatic changes in foreign policy that will reduce our reliance on military force). One of two Trident II D5 missiles tested June 2 by the U.S. Navy. SUNNYVALE, Calif., June 4, 2014 -- The U.S. Navy's Trident II D5 Fleet Ballistic Missile, built by Lockheed Martin [NYSE: LMT], has achieved 150 successful test flights, setting a new reliability record for large ballistic missiles. The Navy launched two unarmed missiles June 2 in the Atlantic Ocean from a submerged Ohio-class submarine, marking the 149(th) and 150(th) successful test flights of the missile since design completion in 1989. The test flights were part of a demonstration and shakedown operation, which the Navy uses to certify a submarine for deployment following an overhaul. The missiles were converted into test configurations with kits containing range safety devices and flight telemetry instrumentation. The operation included the first flight of two modernized avionics subsystems that control key missile functions during flight. The subsystems were updated under the D5 Life Extension program, which incorporates current technologies into the missile's electronics to cost-effectively prolong the service life of the reliable D5 missile design on current and next-generation submarine platforms. "The success of this Life Extension flight is a tribute to the dedication and innovation of the entire government and industry team," said Doug White, Fleet Ballistic Missile programs vice president, Lockheed Martin Space Systems Company. "In partnership with Navy Strategic Systems Programs, we set the bar high to provide a credible, reliable and affordable sea-based strategic deterrent for the nation." First deployed in 1990, the D5 missile is currently aboard U.S. Navy Ohio-class and U.K. Royal Navy Vanguard-class submarines. The three-stage, solid-propellant, inertial-guided missile can travel a nominal range of 4,000 nautical miles and carries independently targeted reentry bodies. Lockheed Martin has been the Navy's strategic missile prime contractor since 1955. The company also performs program management and engineering services for the Royal Navy under the Polaris Sales Agreement.